WHITBY, ON – 5 Paddles Brewing has announced plans to release five beers brewed with pumpkin – or pumpkin pie spices – in October, while also planning for a brewery move at the end of the month. 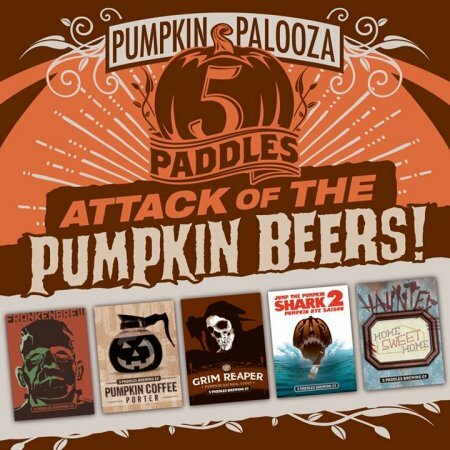 For what is being called Pumpkinpalooza, 5 Paddles will be releasing Frankenbrew, Pumpkin Coffee Porter, Grim Reaper Pumpkin Stout, Jump the Pumpkin Shark 2 Pumpkin Rye Saison, and Haunted Home Sweet Home Pumpkin Vanilla Wheat. Release dates will be announced soon on the 5 Paddles Facebook page, and all of the beers will be available exclusively in 650 ml bottles at the 5 Paddles brewery store. That store, as well as the full 5 Paddles operation, will soon be relocating to a larger space at 1390 Hopkins Street, just down the street from the current brewery. As noted in an announcement on the 5 Paddles blog, the brewery will close for the move at the end of October, with plans to be up and running in the new space by mid-November.